In fact for me, it means the opposite. I'm all for extending the celebrations into this new year, rather than heading straight into hibernation mode now that December is a thing of the past. That being said, both of us have felt a very real need to get back to more mindful and plant-focused eating habits, and in the spirit of keeping the party going, while also realizing everyone is desperately trying to dial it back after holiday indulgence, I was inspired to share our favorite standbys for a lighter spread. 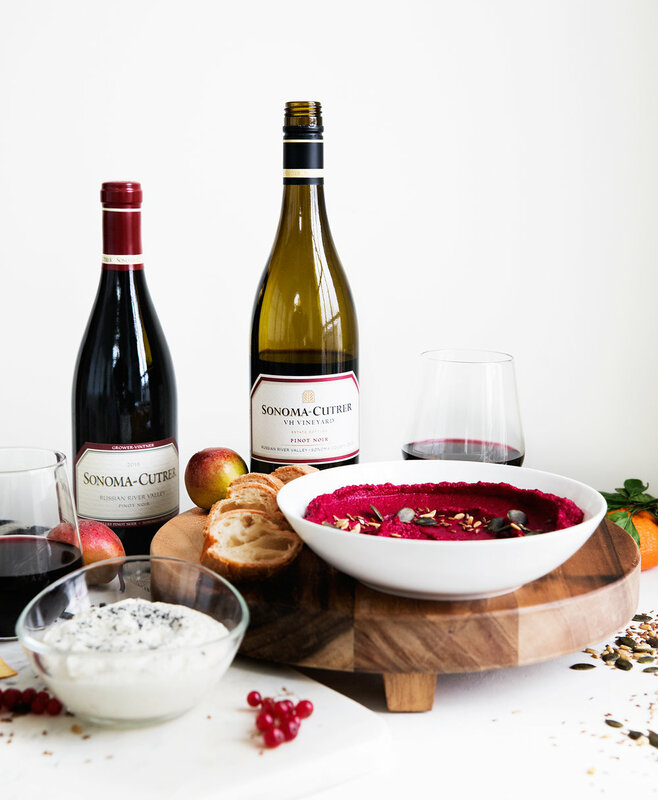 Our Beet Hummus with Seeds, and super simple Honey Ricotta with Black Salt taste decadent, but are on the lighter side, work great for a crowd, and of course pairs seamlessly with a bottle, or two of wine. We paired everything here with Sonoma-Cutrer's Pinot Noir, and were blown away by the quality and versatility of the wine. I find myself leaning towards Pinot more and more frequently as of late, whereas it's a always been a favorite of Robert's. As I'm sure you know by now, we are dangerously teetering into the wine nerd category. Just ask the wine shelf, actually 3 wine shelves in our basement. During our honeymoon in Northern California I had an abundant opportunity to expand my palette for Pinot, but it wasn't until more recently that I started to really appreciate it thoroughly. The Vine Hill Pinot we featured here pairs amazingly well with root vegetables, making it the perfect compliment of the beet hummus. thank you Sonoma-Cutrer for sponsoring this post! Toss beets with 1 tbs olive oil and season with salt and pepper. Wrap individual beets in aluminum foil and roast on a baking sheet for 1 hour. Remove beets from oven and let cool, about 30 minutes. When cooled, remove skin from beets and roughly chop into a 2’’ dice. 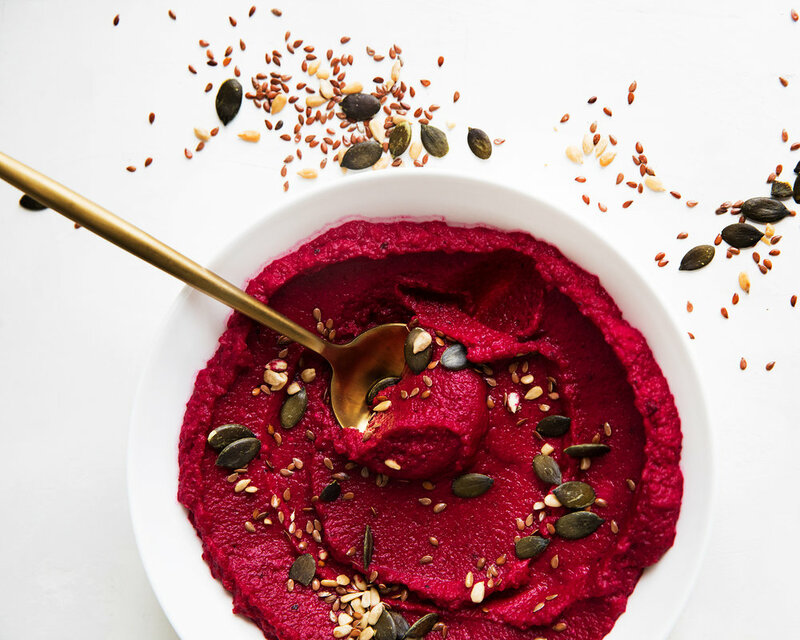 In a food processor, combine diced beets, tahini, and juice of 1 lemon. When beets are broken down and combined with tahini and lemon juice add garbanzo beans, garlic cloves and additional 1/4 cup olive oil. Mix all seeds together in a small bowl. Drizzle olive oil in a small pan over low-medium heat, add seeds and toast lightly. About 3-5 minutes. Cool to room temp before topping hummus. In a small nonreactive bowl, whisk together ricotta, honey, and olive oil. To serve, top with black sea salt.